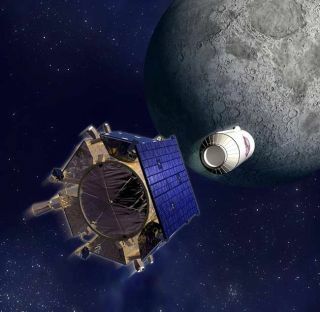 Officials are hurriedlylooking for ways to save fuel on NASA's $79 million lunar impactor missionafter a crisis Saturday caused the spacecraft to burn more than half of itsremaining propellant. The Lunar CraterObservation and Sensing Satellite used about 140 kilograms, or 309 pounds, ofmaneuvering fuel to maintainthe probe's orientation in space Saturday, according to Dan Andrews, themission's project manager at Ames Research Center. LCROSS is tugging a41-foot-long Centaur rocket stage on a circuitous route through space.Scientists are preparing for a fleeting series ofobservations as the spent booster is released for a suicidalplunge into the moon on Oct. 9. The goal is to hit ashadowed crater near the lunar south pole to see if water ice deposits residethere. The 6-foot-tall shepherdingspacecraft's attitude control system was specifically designed to handle theunusual job of positioning the 47-foot-long stack as it flies toward the moon. "It was a tough day,as you can imagine," Andrews said. "But what it's done is given us arazor's focus on how to manage the remainder of the propellant." LCROSS is now perilouslyclose to its built-in propellant margins, and Andrews said the team willprobably have to cancel some activities that are not crucial to the mission. "Our estimates now areif we pretty much baseline the mission, meaning just accomplish the things thatwe have to (do) to get the job done with full mission success, we're still inthe black on propellant, but not by a lot," Andrews told Spaceflight Nowlate Tuesday. LCROSS now has between 20pounds and 40 pounds of extra propellant that could be used in unplannedactivities, a relatively thin margin for satellite operations. "We can finish thismission, but it makes our sensitivity to something happening quite high,"Andrews said. The anomaly occurred out ofview of ground stations, so LCROSS engineers were not aware of the problemuntil the antenna acquired the spacecraft later Saturday morning. "When we acquired thesignal, we discovered that the thrusters had been very busy and that thepropellant in the tank was reduced quite a bit," Andrews said. After regaining contactwith LCROSS, controllers traced the fault to the Inertial Reference Unit, asensor that measures the craft's attitude. Software on the satellite detectedthe issue and automatically switched attitude determination to the star trackersystem as designed. "Those star trackerrates are inherently noisier, but they were noisier than we had anticipated,"Andrews said. Thrusters struggled to keepthe six-sided spacecraft pointed in the right direction, but data from the startracker caused the control system to use a substantial amount of fuel. "Our system wasworking very hard to keep up with them, and in doing so was expending a lot ofpropellant. And because we were out of view, we couldn't do anything aboutit," Andrews said. Engineers recovered the IRUand reduced propellant usage back to normal levels, according to Andrews. "We stopped the bleedingpretty quickly," Andrews said. When the anomaly occurred,LCROSS was turning the Centaur around to warm up the rocket to evacuate waterice carried into space. Officials want to get rid of the trapped water toensure the accuracy of navigation and science results. NASA is now working withthe suppliers of the reference unit and star tracker assembly to find the rootcause of the problem, the agency said in a statement. In the meantime,controllers have changed the satellite's software logic to decrease itssensitivity to similar events. "For example, if wefind that the spacecraft in inclined to do a bunch of thruster firing activity,or if we notice one of the key avionics elements failed, we would rather gointo a free drift than expend a bunch of propellant and seal our fate,"Andrews said. NASA recognizes LCROSS as arisk-tolerant mission, meaning the project has a "moderate chance" ofnot achieving success. "We've made ourspacecraft very simple," Andrews said. "What that did is it allowed usto fit into an incredibly tight cost and schedule box."